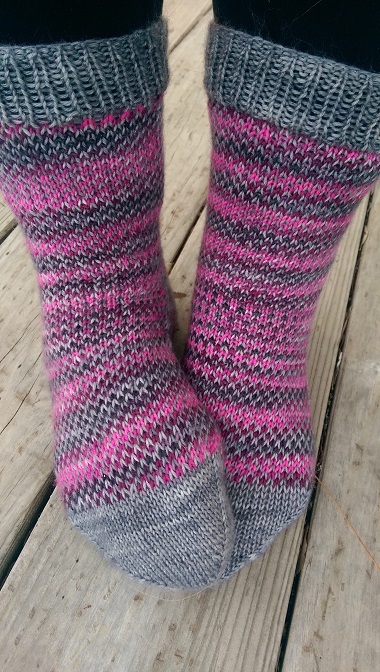 FO: The April 2015 Socks are Done! This morning I discovered that the Pulitzer Prizes winners had been announced. Wow! All the Light We Cannot See won the prize for fiction. I loved this book! I was consumed by the story and thought about it for days after finishing it. I finally wrote a post about it. I am so happy that it won!! 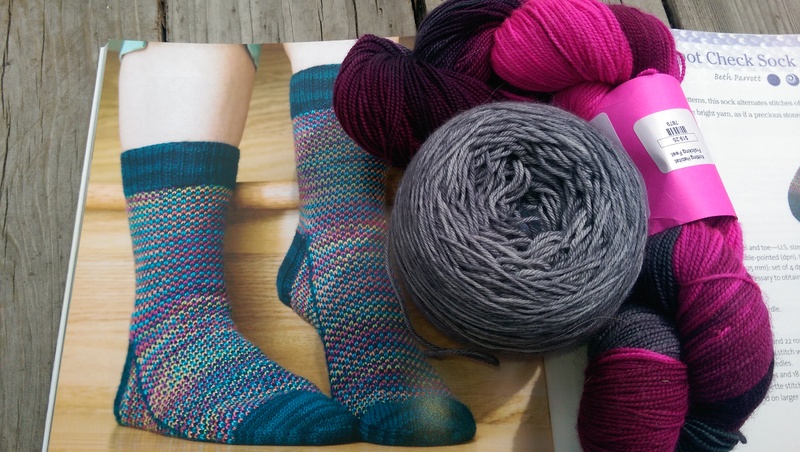 I was a happy knitter as I settled in to finish the April 2015 socks. Some mistakes were made (OK, I forgot to change to smaller needles when I made the second sock’s toe. This is a mistake that I can live with. If it wears out too soon I’ll cut the toe off and knit a new one with the correct needles. Fearless knitting goes a long way! ), but I’m happy with how they look. Here they are. Look at the fun garter stitch detail on the heel and the way the decreases make that grey line down the side of the feet. Fun, huh! Oh yeah: see how one toe is bigger than the other? That was the needle change mistake. Here they are from the front. The pink yarn still pooled, but things were controlled a little by the grey yarn. It’s kind of interesting how the pooling changed in the part of the sock where I was knitting the gusset (top of foot in the picture). Here’s the yarn that I used and the pattern. 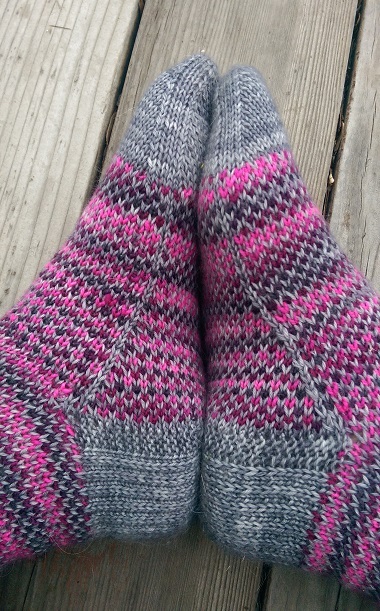 This is the Spot Check Sock pattern from the book Knitting Socks with Handpainted Yarn by Carol J. Sulcoski. Here is the project page on Ravelry for the socks if you want more details. Tomorrow I am going to starting winding all of my new yarn and it will be time to cast on for the next project. Woohoo! Knitting paradise here I come! I loved “All the Light…” too! It was off genre for me, but I was really engaged. I really love these socks, they look great! Im phobic about crochet because it makes my hand hurt, and now I feel I’ve lost my skills. Thanks, that would be great 🙂 I’m sorry you can’t do crochet anymore, that must be rather frustrating! Wonderful socks! I’ve been on the waiting list for All the Light for what seems like forever, maybe it will be my turn soon! The forever line at the library. 🙂 I’m in a couple of those right now. All the Light is worth the wait. Hope you get it soon. Love your socks! And I loved All the Light We Cannot See, too. Wonderful book.